Restoring the justice and prison systems back to working order is an essential and often urgent task for post-conflict states. 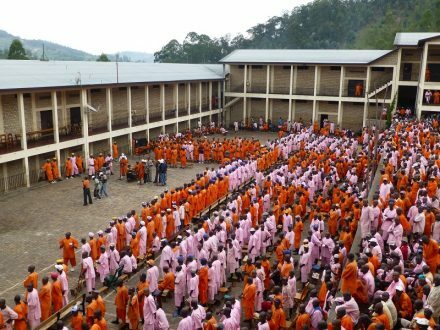 In this expert blog for PRI, Terry Hackett, Warden of Pacific Institution in British Columbia (BC), Canada, draws on his recent research into civil society action in justice and correctional reform in Rwanda after the genocide of the early 1990s, to demonstrate the potential value that civil societies can bring to correctional reform processes in a post-conflict setting. Terry’s qualitative research, derived from 22 interviews of government officials and former and current NGO staff members involved in correctional reform since the 1994 genocide, as well as observations and site visits that occurred in Rwanda in late 2014. A full account of his research can be found in his recently published article The Prison should not be an island: the role of Civil society in post conflict prison reform in Rwanda, Acta Criminologica: Southern African Journal of Criminology Special Edition No 1/2015: Change in African corrections − from incarceration to reintegration. Civil society not only plays a critical role in partnering in the rehabilitation of inmates, but in many ways influences or even drives change or reforms within correctional systems, at the local or national levels. In 1994, the then Rwanda Prison Service faced an unprecedented humanitarian crisis, holding over 120,000 prisoners, the vast majority of them genocide suspects (1&2). Compounding this crisis was the lack of judicial capacity resulting in significant pre-trial detention delays with only 6,000 of the over 100,000 genocide suspects slated for trial by 2002 (3). According to many observers at the time, the conditions of confinement were not only inhumane and responsible for the loss of thousands of lives, but were also the worst ever seen by many experts and practitioners (2). Over the 20 years following the genocide, non-governmental organizations (NGOs) such as Médecins Sans Frontières (MSF), Dignity in Detention (DID), Just Equipping, Penal Reform International (PRI), the International Committee of the Red Cross (ICRC), and Human Rights Watch responded in their own unique ways to the crisis in the Rwandan Prisons. As the capacity of Rwandan civil society developed, local NGOs such as Prison Fellowship Rwanda, Never Again Rwanda and others began to assist the Rwandan Correctional Service (RCS) in their reform efforts. In all, 11 NGOs (7 international and 4 local actors) were identified as playing a role in post-conflict correctional reform in Rwanda. Although each civil society actor brought their own unique set of experiences and resources to the equation, the role civil society played in post-conflict prison reform in Rwanda generally fell within three areas: Peacebuilding and Reconciliation, Monitoring and Advocacy, and Operational Partnership and Support. Civil society actors involved in Peacebuilding and Reconciliation activities were mostly active in support of the Rwandan government’s transitional justice efforts. This included the provision of restorative justice programs, peacebuilding workshops within the prisons, as well as the establishment of reconciliation villages in six communities where Génocidaires who were released from prison would live and work beside their victims and their victim’s families. Monitoring and Advocacy was approached in various ways with each NGO taking their own unique approach, with initiatives ranging from traditional human rights monitoring to the piloting of paralegal services within the prison system. Operational Partnership and Support efforts included civil society partnering with the RCS to improve the conditions of confinement through infrastructure projects, the provision of materials or supplies, the delivery of staff training on human rights, as well as vocational training to offenders. Overall, civil society’s role in all three areas assisted the RCS in working towards meeting components of the United Nations Standard Minimum Rules for the Treatment of Prisoners (SMRs). The unique history, culture, political climate and unity and reconciliation focus of the Rwandan government certainly had a direct influence on the role of both international and local civil society actors in correctional reform. For example, the lack of democratic space available for local Rwandan civil society to operate, limited their role in the area of monitoring and advocacy. However, the commitment of local actors to the national unity and reconciliation agenda positioned them to partner with the RCS on peacebuiding and reconciliation initiatives such as victim offender mediation, and programs associated to the Rwandan transitional justice mechanism of Gacaca. By contrast INGOs were better positioned to play a role in monitoring and advocacy due to their ability to operate more independently than local actors. For local or international civil society to participate in prison reform in a post-conflict environment there are several challenges that need to be overcome. One challenge that is not exclusive to Rwanda but was certainly present is that of the need for correctional officials to balance ‘rights v. order’ (4) when granting permission for civil society to become active within the walls of correctional facilities. For example, officials may be concerned that opening up their facility to ‘outsiders’ will bring criticism about conditions that they have no resources or capacity to improve. In the case of Rwanda, government officials expressed concern with certain International NGOs active in the area of monitoring and advocacy who identified issues pertaining to conditions of confinement or human rights concerns without offering solutions or assistance. This challenge was overcome in part by several local and international civil society actors through the establishment of mutually supportive or beneficial relationships with the RCS. Although previously outlined (4&5) in other correctional reform contexts, the establishment of relationships with shared goals between civil society and the correctional authorities in Rwanda was unique given the post-genocide environment as well as the Government’s strong political agenda focused on peace and reconciliation. In addition, when NGOs approached their involvement with the RCS as a partnership and the NGO’s goals aligned with those of the RCS, there was more likelihood of implementation. The importance of the involvement of civil society in correctional reform also became evident when observed through the lens of the Rwandan context. Although an inherent link has previously been observed between Rwandan society and their prisons (2), interviews and observations clearly identified a strong qualitative theme outlining the depth of this connection that begins with the intimacy that occurs between a victim and a perpetrator. However, in Rwanda, this intimacy is on a national scale and has been reinforced by the government through national unity and reconciliation policies and initiatives. A sense of collective responsibility underlined the participants understanding of correctional reform in Rwanda, as from their perspective, correctional reform cannot occur in isolation from civil society. One Rwandan government official stated “The Prison should not be an Island”, as both government and NGO officials agreed that civil society brought fresh ideas and best practices to the RCS during a critical time. Moving forward, the government of Rwanda and the international community is encouraged to continue to identify opportunities that will stimulate the ongoing growth of civil society’s involvement in correctional reform in Rwanda. For example, the contracting of specific services such as vocational training to a local NGO through a hybrid funding model where limited government funds are combined with donor dollars in a way that is not only mutually beneficial, but contributes to sustainability and local ownership. International donors and the INGO community are also urged to consider capacity building initiatives and coordination activities in support of local civil society involvement in correctional reform. A national platform or association that coordinates and advocates for civil society correctional reform activities with the RCS would also assist in raising the profile of NGOs involved in correctional reform in Rwanda and build internal and international financial and political support for initiatives. This research was the first to explore the role of civil society in post-conflict correctional reform and was focused exclusively on post-genocide Rwanda. Further research is required in order to outline the impact and application in other post-conflict settings. However, correctional practitioners and the international community should take note of the diverse role civil society can play in correctional reform within a challenging post-conflict environment in assisting our collective efforts in working towards the SMRs. In the future, our ability to jointly address the ‘rights v. order’ challenge and find mutually beneficial opportunities for Correctional Services and civil society actors to work together, will dictate our success in meeting the new benchmarks outlined in the Nelson Mandela Rules within post-conflict environments and as well as within nations where peace reigns. Penal Reform International. 2010. The contribution of the gacaca jurisdictions to resolving cases arising from the genocide. Tertsakian, C. 2008. Le château: The lives of prisoners in Rwanda. London: Arves Books. Luyt, W. 2003. Genocide in Rwanda: Detention and prison involvement. Acta Criminologica 16(4): 96-111. De Andres, A., Rodriquez, M., & Doin, G. 2014. Working paper 1: Civil society and prisons: The ‘invisible bars’ challenge. United Nations Office on Drugs and Crime. Mnyani, M. 1994. Community involvement in prisons. Center for the Study of Violence and Reconciliation. Terry Hackett holds a MA of Human Security and Peacebuilding from Royal Roads University in Victoria BC and a BA in Psychology from Trinity Western University in Langley BC. Terry has held a variety of posts with the Correctional Service of Canada (CSC) over his 20 year career and is presently the Warden of Pacific Institution in Abbotsford BC. Previously, Terry represented Canada abroad as the Director of Corrections for the Kandahar Provincial Reconstruction Team in 2009-2010 and has presented on correctional reform on several occasions including the International Security Assistance Force (ISAF) Corrections Conference in Kabul, Afghanistan and the International Corrections and Prisons Association (ICPA) conference in Ghent Belgium. Terry is the recipient of several awards including the Canadian Operational Service Medal and Bar-South West Asia, Canadian General Service Medal- South West Asia, Queen Elizabeth II Diamond Jubilee Medal, CSC Commissioner’s Commendation and most recently was awarded the Royal Roads University Founders Award. Note: The views expressed are solely those of the author and do not necessarily reflect those of the Correctional Service of Canada. I have been keenly interested in your journey within corrections, here and abroad. I am comforted to know that you have the understanding and drive to be the best helper you can be. Thanks for this great job. I am interested in doing more on Rehabilitation and I believe I can benefit immensely from your wealth of experience. Could you please avail me your email address. Terry is currently Warden of Pacific Institution in British Columbia (BC), Canada, and has worked overseas in correctional reform in Afghanistan. Terry Hackett, Warden of Pacific Institution in British Columbia (BC), Canada, draws on his research into civil society action in justice and correctional reform in post-genocide Rwanda to demonstrate the potential value that civil societies can bring to correctional reform processes in a post-conflict setting.